Rabbi Levi Brook, a native of Brooklyn New York, is one of fifteen children and always was noticed for his exuberant personality and sharp wit. Levi attended Ohalai Torah Religious Schools, and upon graduating studied two years abroad in Burnoy France. Upon returning to the states he began his Rabbinical studies in Los Angeles California, and he finished his final year of testing, becoming a Rabbi back in his hometown. Levi spent his summer breaks traveling the globe from Russia, to Israel, to Los Angeles, and Arizona, bringing Judaica and kosher food to the Jewish inhabitants, and infusing them with his energy and excitement for Judaism. Mrs. Fraidy Brook a native of Detroit Michigan, is the youngest of seven children. Upon graduating high school she attended Beth Chana Teachers Collage in Tzfat Israel, graduating with a degree in early childhood education. She then moved to Alaska to teach in the Chabad preschool there, as well as assist the local Chabad emisseries with their outreach programs. After a year in Milwaukee teaching, and assisting in running the Friendship Circle based in Bayside, she moved to Brooklyn where she met Levi. She taught at the Chabad preschool in Park Slope for 4 years. During her summer breaks Fraidy spent time as a counselor in Jewish day camps in Wisconsin, Ohio, Michigan and Kazakhstan! Rabbi Levi and Fraidy, moved here from Walnut Creek, California where they directed the Chabad synagogue services and all of its affiliate programs. Those included Sunday Hebrew School, Bar/Bat Mitzvah lessons, Camp Gan Israel summer day camp, Holiday Programming for families, The Jewish Women's Circle, and Adult Education. 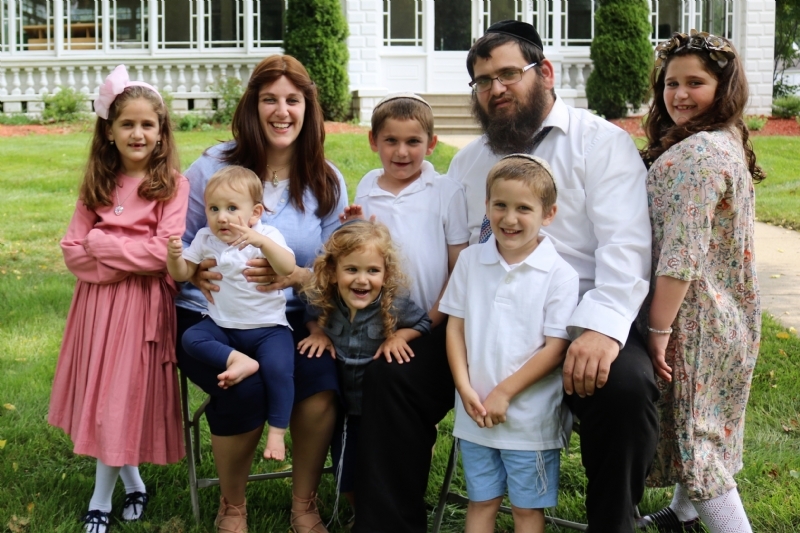 Their children, Esther (8), Raizel (7), Meir (5), Mendel (4), Motty (2) and Yasef (not pictured) work hard to assist in all activities!